An oak seat and seats with seat backs in a range of colours. The Seat Back is an aesthetic piece for seats. Seat backs can be placed on any seat, even if the wood types are different; they are purely cosmetic. If the seat back doesn't go on the seat the right way then just shift right click with a screw gun on the legs of the seat to rotate it into your preferred orientation. Seat backs can be removed by right clicking with a Screw Gun on the seat. 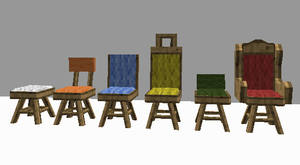 The seat back can be crafted out of any of the four types of wood found in vanilla Minecraft (there are add-on packs for other mod woods) and will appear to be the corresponding colour, but note that it must be built entirely out of one type of wood (you cannot mix woods in its construction). You can dye the cloth part of the seat back any of the 16 standard vanilla colours by right clicking on the seat with the appropriate vanilla carpet tile. You can not dye the seat back a separate colour than the seat. To remove the colour right click with a Screw Gun on the seat to get the carpet back. This page was last modified on 19 May 2016, at 05:40.